The Strait of Malacca, a narrow Asian waterway has long been considered dangerous. Heightened tensions in the region has seen the Strait become part of a de-militarised zone separating the contested territories of Malaysia and Singapore. 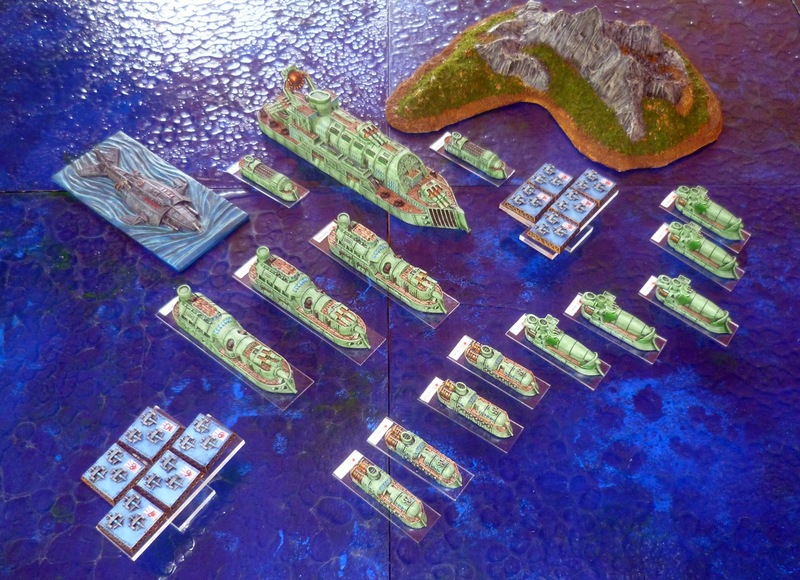 Fortifications built on either side of the strait, intended to provide security for merchant shipping, have instead resulted in a rapid escalation of arms, culminating in a massing of military strength on either side. Tensions are now so high that the smallest incident could ignite full-blown war. 3. You may use allies, following the ally rules (summarised in the fleet construction guides), remember allied models do not benefit from your commodore abilities. 4. You may employ mercenaries or merchants, remember these models do not count toward the Tournament Construction maximums or minimums. 5. 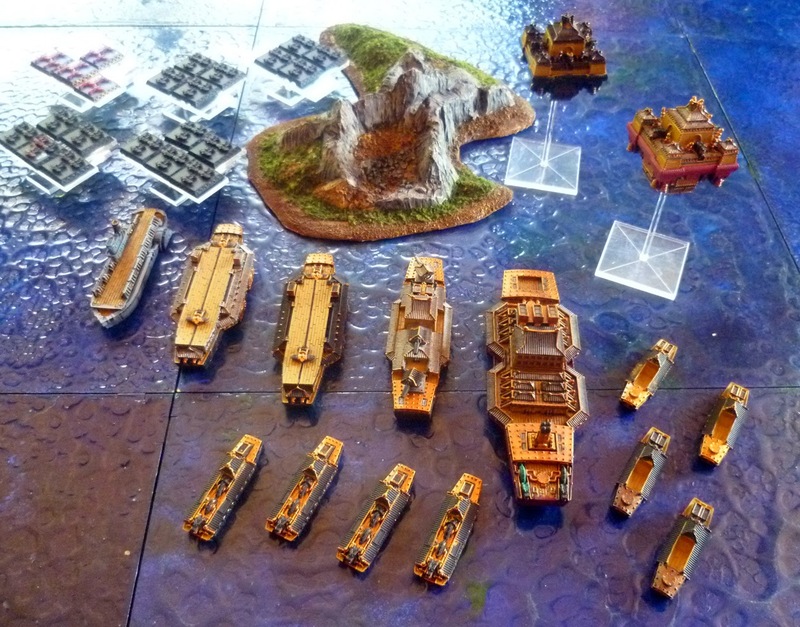 You must choose either a fleet commodore, a national commodore or purchase a heroic commodore to lead your forces and designate the model they occupy before the game begins. 7. Each side (of 2 players) is assigned 1 Bunker for no points cost (note this is a Bunker, not a Bunker Complex). The nationality of the Bunker must be the same as one of the nations on that side. If neither nation can field a Bunker model in their normal list, then the players may choose from 1 of the Bunkers available to the 4 core nations in the DW core rules. Players roll randomly to determine an ally and shared board edge. Both Bunkers are placed on opposite sections of coast (within 4" of the water) 32 inches from the opposing deployment zone. Mines are deployed with bunkers, and may be placed on sea or land. There will be little covering terrain. Campaign points are scored collectively for each side. Destroying an enemy Bunker scores 10 points. Prizing a Bunker scores 16 points. If the Bunker Complex is neither destroyed, made derelict or prized, the controlling side is awarded 10 points. In addition the Hurricane Season Campaign points are applied: 1 per small model destroyed, 2 per medium model destroyed, 3 per large or massive models that are on half HP, 6 per large or massive models that are destroyed or derelict, 9 per large or massive model prized. After the random roll the Australians and Chinese were allied in this game against the Blazing Sun and French. 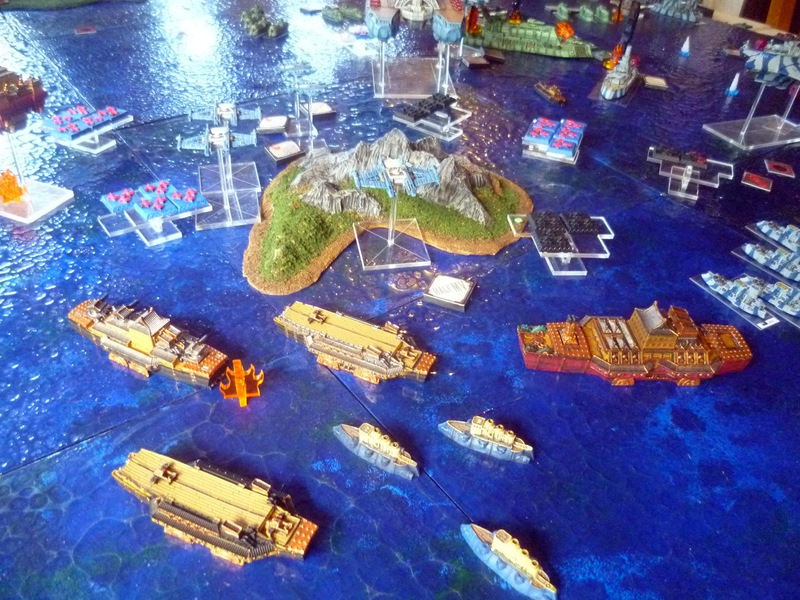 That meant that both sides had a lot of tiny flyers (the French and Chinese each bringing more than 20 to the table) but the Japanese and French also had the weight of large models on their side (a sky fortress, dreadnought, Death Bringer and Tourbillon vs 2 pocket battleships, an Osprey and a Chinese battleship). 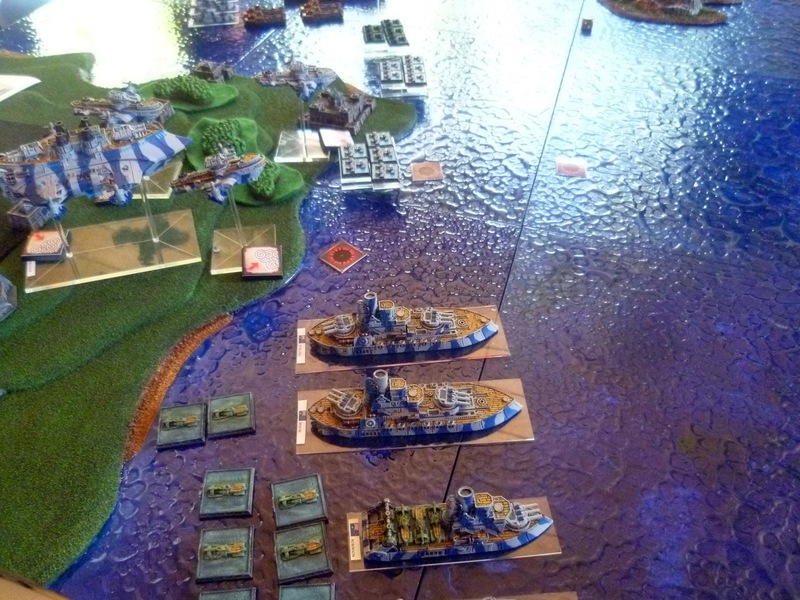 The Australians had designed their force to have a defensive and offensive component with the Osprey and kestrels remaining to protect the bunker and their naval forces surging forward on offense. The Chinese intended to use their Bastions to shield their force which would advance in a single (slow moving) mass. The Australians took one flank, the Chinese the other. 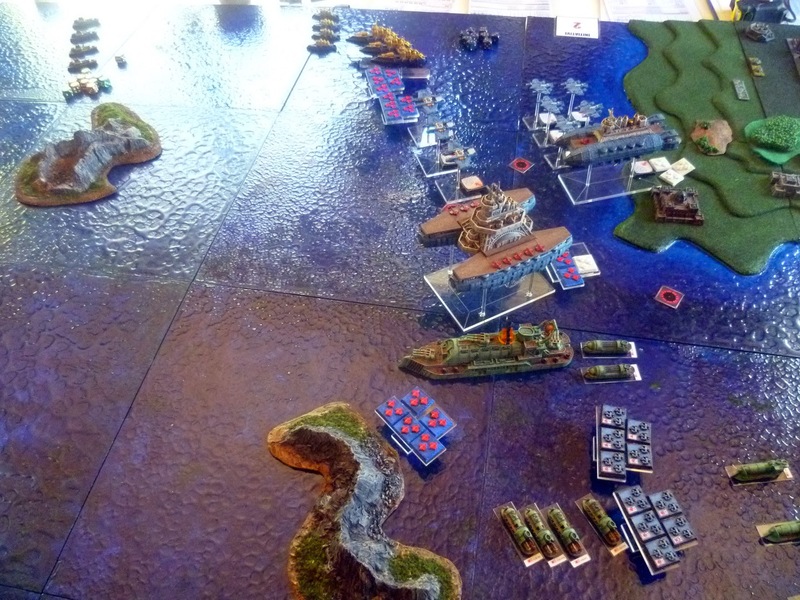 On the opposing side, the French and Japanese wisely place their sky fortress, dreadnought and tourbillon together to make a central force with massive firepower. On the flanks, the Black Wolf and Japanese gunships faced the Australians, while the French flyers and skimming cruisers faced the Chinese. 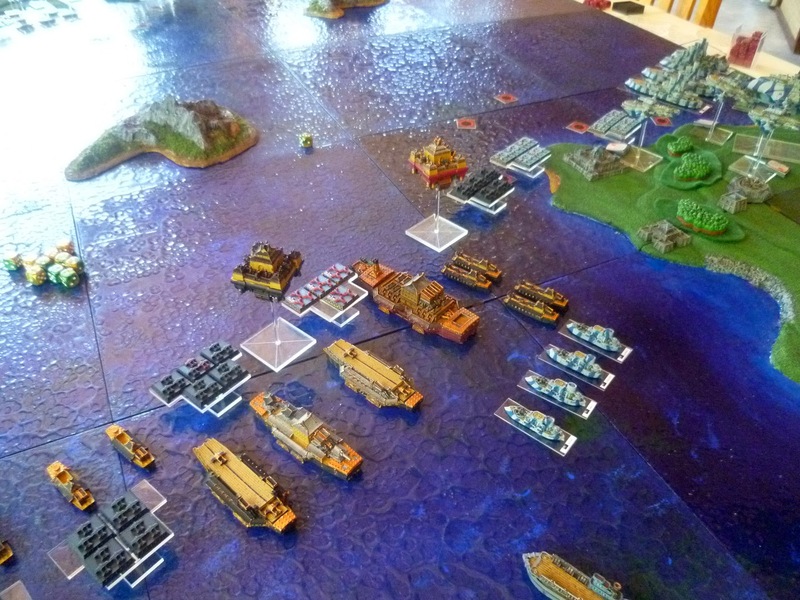 In the first turn the Blazing Sun forces marked the Australian pocket battleship squadron as a priority target. The Death Bringer submarine gave the Australians a taste of their own medicine with a devastating torpedo salvo, and the French peppered the Chinese floating bastions starting a raging fire. In return the Chinese managed to knock a hull point of the Blazing Sun dreadnought. The Australians dropped more mines around their bunker. In the second turn things got brutal, as both sides closed. The Japanese poured more fire onto the Australian flagship, scoring more critical hits and starting several fires. 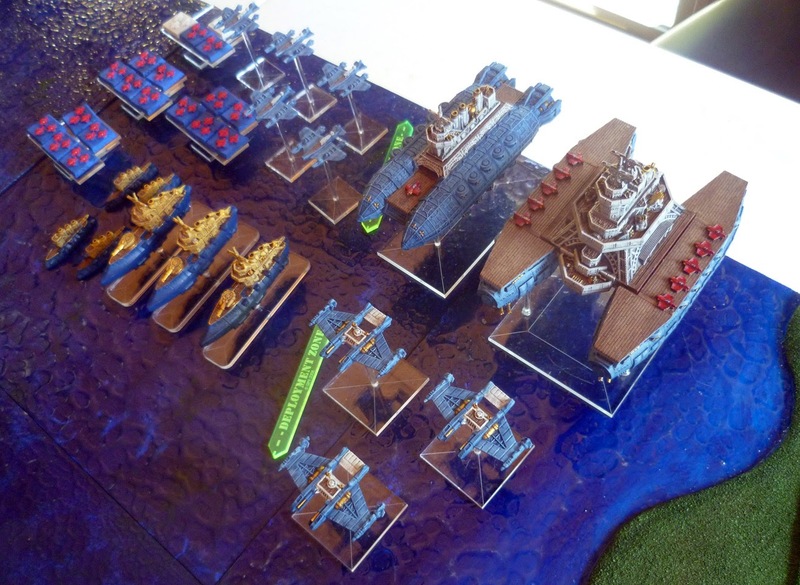 The Australian pocket battleships concentrated their fire on the Tourbilon heavy flyer and scored a triple critical, blowing it out of the sky! In response the Blazing Sun Dreadnought opened up on the Australian flagship, and sunk it, causing some panic amongst the Australian fleet. 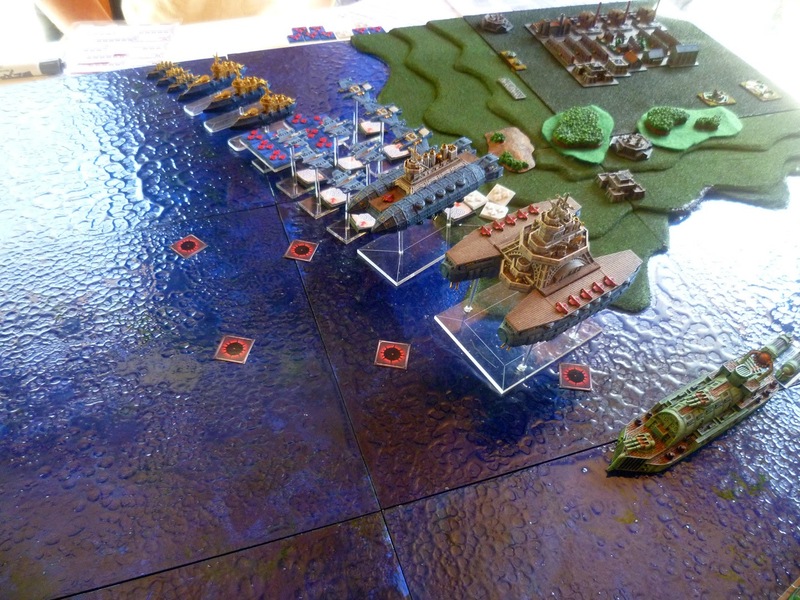 On the other flank, French frigates weaved amidst the Chinese carrier group, causing much damage, meanwhile the Chinese fire began to knock the Ecuyer cruisers down, one-by-one. The French admiral dispatched the Voltaire interceptors to plug the gap, and the Chinese suffered further losses, before their shaolin monks captured one of the French air machines. Dogfights raged overhead as French and Chinese tiny flyers engaged one another. The Australians now made a concentrated effort to take the Japanese dreadnought, Kestrel rotors bombed the mighty ship, and boarded its escorts before it was raked with fire from the turrets of the Osprey rotor, Protector class frigates and remaining pocket battleship. Finally the crocodiles surged forward attempting to board, but the Japanese sky samurai held firm, despite the serious damage done to the flagship. 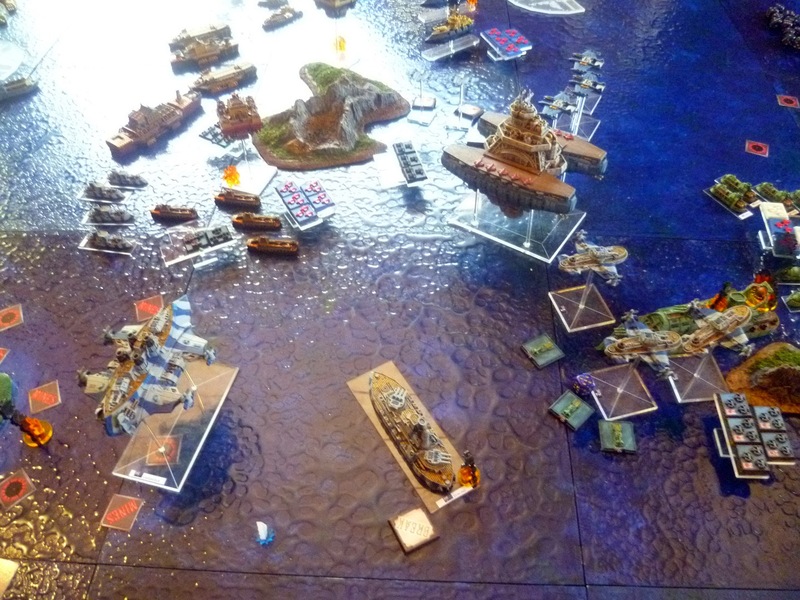 Not to be outdone, the Japanese torpedo bombers scored a further critical hit on the remaining Australian pocket battleship before the samurai aboard the gunships captured and prized it in a fiercely contested boarding action. In a final desperate throw of the dice, the only surviving kestrel rotor dropped a mine on the undamaged Japanese gunships. The mine exploded with terrifying force, scoring a critical on all 3 gunships. The first gunship suffered a magazine explosion, and the force of that blast was enough to trigger a magazine explosion on the second gunship, which then scored a further critical on the third gunship. Then, the surviving two marines on the Kestrel boarded the now defenceless Japanese dreadnought and prized it booting flagging Australian spirits immeasurably! 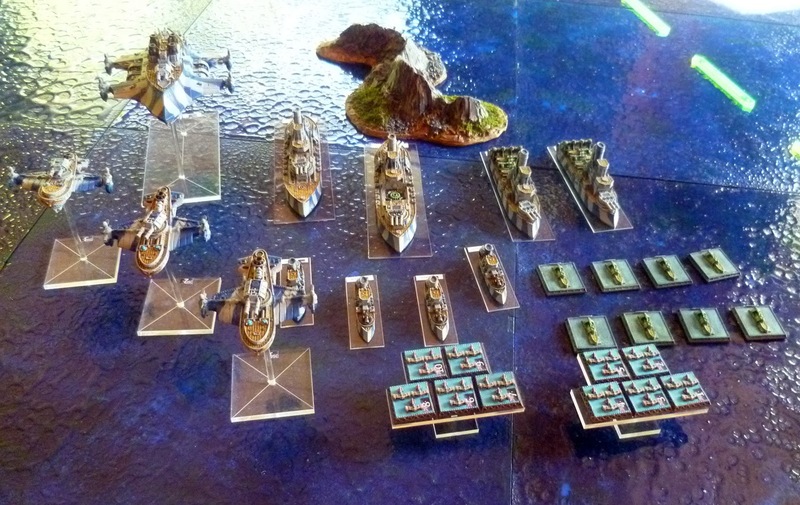 The Japanese would have the final word however, as their Uwatsu frigates recaptured the now derelict dreadnought and the Black Wolf downed the badly damaged Osprey, leaving the Australians without any models beyond half a squadron of tiny flyers. The French had suffered serious losses as well but the mighty Vauban was undamaged, and a fearsome foe to be reckoned with. The Chinese had lost all their small ships, a battlecrusier and bastion, but their carriers and battleship remained operational. The French and Japanese managed to score a resounding victory. 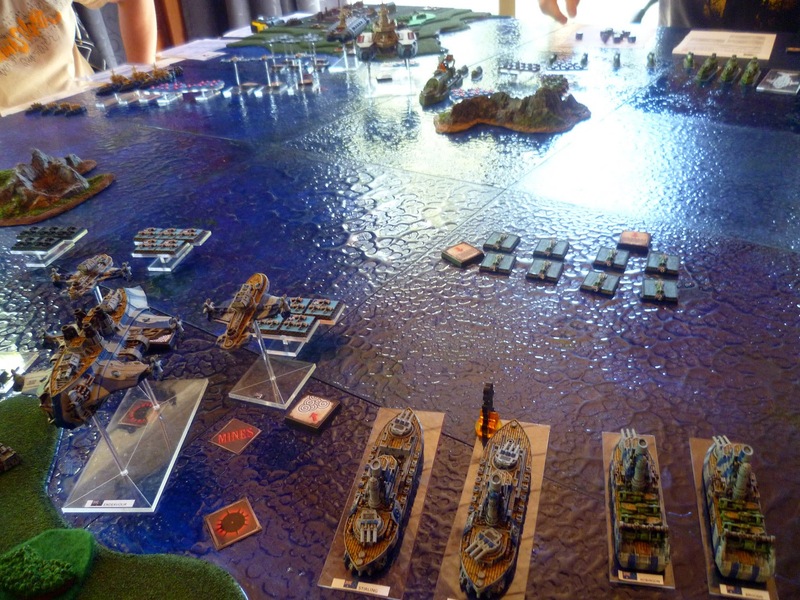 Neither bunker was seriously threatened with capture or destruction, but the drive to try and capture the bunkers brought serious carnage to the centre of the table, with each player dedicating their forces to smashing through the enemy, which made for a fun game. The French and Japanese were deserving winners for concentrating their most powerful models together, while the Chinese and Australians failed to effectively coordinate their efforts. The Australians in particular suffered huge losses, but managed to devastate the Japanese fleet (although the destruction of the gunships was pure luck).